Winter takes its toll on every inch of your vehicle, so once you’re pretty sure winter salt, snow, temperatures are behind you, it’s time to get your vehicle ready for Spring. Here are five simple things you can do yourself to bring your car back to a summer shine. You can’t see it, but your car is coated with salt, sand and debris that will cause corrosion and eventually rust. Rust is more than a superficial blemish, it can spread, lowering the resale value of your vehicle and weakening the structure. Most car washes offer an undercarriage power wash option, or simply use your own hose to spray under there, using a jack if you have one. There’s no need to use soap, just a strong jet of water does the trick. You might be surprised at how dirty your engine gets after the winter. Wipe down the engine with a soft mitt and soapy water, picking out any pine needles, leaves and debris that find their way into the engine compartment. Check the battery terminals for crusty white residue, because this represents corrosion. If you see any, scrub off with a toothbrush, baking soda and water. Thoroughly cleaning your vehicle and waxing it with a paste or liquid wax, will ensure your vehicle is free from any road grime and contaminates. Easy to miss places, like the underside of doors, the bottoms of doors and compartment seals like trunk seals and window channels require cleaning. Follow up with a silicone spray, which repels dirt and adds lubrication so windows function smoothly. Salt can also stain and permanently damage the fabric surfaces of your cars interior. Renting a steam cleaner is inexpensive and will remove salt residue from inside the car. Also, winter is over, so remember to remove bags of salt and ice scrapers from the trunk. Wiper blades get a workout during the winter months, and the cold temperatures can degrade the rubber on the blades. If you notice your wiper blades leaving smears or streaks on your windshield or you hear squeaking noises, it’s time to replace them. If you’ve been following a regular maintenance schedule and doing normal winter driving, you probably don’t need your tires rotated, but you should check them anyway, starting with your tire pressure. Cold weather can impact tire pressure, resulting in underinflation. Improperly inflated tires impacts your fuel consumption, so it’s well worth the few minutes to ensure your tires are filled according to spec. Also, visually inspect your tires for adequate tread, and uneven wear. The last thing you want is a blown tire, so if you have questions about the wear on your tires, we’re happy to answer them. Safety first. 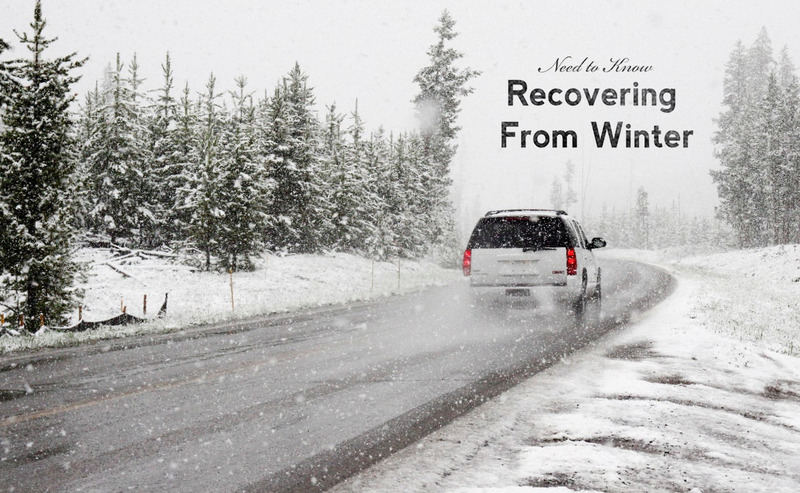 Drivers typically go through more fluid in the winter-especially windshield wiper fluid. It’s inexpensive to replace the fluids in your vehicle, and should change your oil, brake fluid and transmission fluid every 5,000 miles or so, regardless of the season.